When Matthew and John founded Sustainable Aquatics, they collected every known fish feed available on the market and fed them in controlled experiments to countless tanks of young fish. After researching fish feed manufacturing, they learned that most fish feeds are processed at temperatures that destroy important fats and antioxidants. With this in mind, SA Developed its own raw, cold-processed feed to achieve SA’s vision for color, health, size, reproductive health, and grown rate. 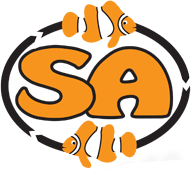 With an effective protein to fat ratio of 3:1 and the best antioxidants and vitamins, SA Hatchery Diet provides complete nutrition for most aquarium animals: freshwater and marine fishes, corals, and invertebrates. Krill Meal Fish Meal, Squid Meal, Wheat Gluten, Potato Starch, Fish Oil, Spirulina, Astaxanthin, Garlic Oil. For continued freshness, refrigerate after opening. Product contains 64 ounces of 2.4 millimeter Sustainable Aquatics Hatchery Diet (Clearly Complete).